The process gas in ethylene plants contains acid gases, namely carbon dioxide and hydrogen sulphide, due to the cracking and coking/decoking reactions in the cracking furnaces. These acid gases are typically removed in a caustic tower. However, aldehydes and ketones, contaminants that are also produced in the cracking furnaces, can polymerize under basic conditions to form aldol condensation polymer. This polymer can deposit on the internals of the caustic tower and in the downstream spent caustic handling facilities (tankage, strippers, etc.). This fouling can lead to serious operating problems that impact the plantâs overall efficiency and reliability and generate high polymer disposal costs. Today, ethylene producers are often faced with more stringent environment, health and safety regulations. This is particularly true in Western Europe and certain countries in Asia Pacific. Environmentally friendly process treatment technology is therefore of great interest and sometimes even mandatory. SUEZ Water Technologies & Solutions has developed a patented, non-toxic aldol polymerization inhibitor program, which can provide reliable protection for both the caustic scrubber and the spent caustic system. 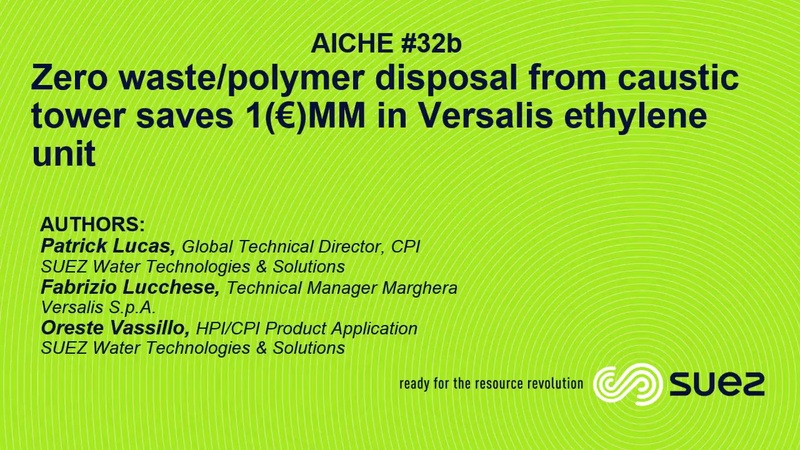 This paper will review an application case in Versalisâ ethylene unit in Porto Marghera, Italy. The innovative, environmentally-friendly technology provided excellent fouling protection and reduced the waste/polymer disposal costs by $1MM/year.